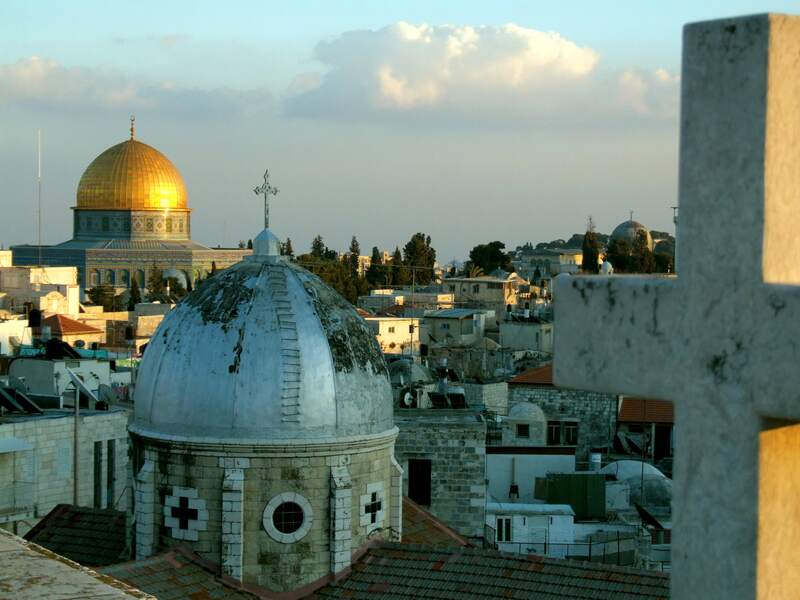 This half day walking tour takes you through the four quarters of the Old City of Jerusalem. Souqs and Bazars: The tour will take you along some of the most famous Souqs and Bazzars in the Old City including Suq Khan al-Zait, Suq Al-Qattanin, Suq Aftimos and Al-Dabbagha and more. Via Dolorosa (Way of Sorrows) and Church of Holy Sepulchre: Retrace the footsteps of Jesus as you walk along the Stations of the cross ending at the Church of Holy Sepulchure. The Austrain Hospice: Enjoy a break at the Austrian Hospice. In addition to its tranquil garden, the roof terrace has been re-designed and offers an impressive view over the Old City of Jerusalem, the Temple Mount, and up to the Mount of Olives. This tour will end at Jaffa Gate. Optional activities include the Rampark Walk where you can walk on the Old City Wall and enjoy an elevated view of the this amazing city. Group Size: min. 3 to max. 12 participants. – Passport: If you will be crossing any checkpoints to get to the starting point, please remember your passport. Option 1 – Bus no. 231: The bus departs from the Damascus Gate Bus Station in East Jerusalem (located on Sultan Suleiman Street) and travels via Beit Jala to Bethlehem. Tickets cost around 8 ILS. Duration: Approx. 30-40 minutes. Note that this bus does not go through the main “checkpoint 300” (Rachel’s Tomb crossing). The bus will drop you off at the Bethlehem / Beit Jala intersection (“Bab el-Zkak”) which is 1 km away from Manger Square. You can easily follow the Pope Paul VI Street to get to the Manger Square and the Church of the Nativity in 15 minutes. You can also take a taxi to Manger Square. Price around 15-20 ILS per drive (not per person). A shared taxi is also available and cost around 3 ILS. Option 2 – Bus no. 234: The bus leaves from the Damascus Gate Bus Station (located on Sultan Suleiman Street) and takes you directly to the Bethlehem Checkpoint – “checkpoint 300” (Rachel’s Tomb crossing) and back. Tickets cost around 5 ILS. Duration: Approx 20-30 minutes. You will have to walk through the checkpoint as you enter and exit Bethlehem. From the checkpoint, you can either walk half an hour or take a private taxi (15-20 ILS) to the center of Bethlehem (Manger Square), which is about 2.5 km away. A shared taxi is also available and cost around 3 ILS. Option 3 – Private Taxi: A private taxi from Jerusalem to Bethlehem city center will cost around 150-180 ILS ($50) in each direction (up to 7 seats van). Duration: Approx. 20-30 minutes. Option 4 – Private Taxi: A private taxi from Jerusalem to Bethlehem’s Rachel’s Tomb “checkpoint 300” will cost round 100-120 ILS ($30-35) and will drop you off outside of Bethlehem. You will then have to cross the checkpoint into Bethlehem on foot and continue from there (see option 1 or 2). Option 1 – Bus no. 218: The bus departs from the Damascus Gate Bus Station in East Jerusalem (located on Sultan Suleiman Street) and ends at the Ramallah Central Bus Station (Located on Al-Nahda Street). Tickets cost around 8 ILS. Duration: approx. 30 minutes. Option 3 – Private Taxi: Take a taxi to the Qalandia checkpoint and walk through on foot. from there you can either take a private taxi (yellow taxis) to Ramallah city center for 30-40 ILS. Alternatively, take a shared taxi (orange mini bus for 7 persons) to the Ramallah Central Bus Station (located on Al-Nahda Street). Duration: approx.20-30 minutes. Option 1: Bus no 263: Take bus departs from the Damascus gate Bus Station in East Jerusalem (located on Sultan Suleiman Street). Inform the driver that you are continuing to Jericho and he will drop you off in Bethany City center ( Al Izrariya) . From there, take a Jericho shared taxi (orange mini bus for 7 persons) to the Jericho City Center. The cost for each ride is around 12-15 NIS.. Duration: Approx 60 minutes. Option 2: Private Taxi: A private taxi from Jerusalem to Jericho will cost around 320 ILS ($85). Duration: Approx 30-45 minutes. The bus will drop you off at the Bethlehem / Beit Jala intersection (“Bab el-Zkak”). From there take a shared taxi to Hebron Central Station located on (located on Wadi Al Tufah Street). Cost around 10 ILS. Duration: approx 45 minutes. Option 3 – Private Taxi: A private taxi from Jerusalem to Hebron will cost around ILS 400 ($110). See options for getting from Jerusalem to Ramallah. From Ramallah to Jenin: Take a shared From the Ramallah Central Bus Station (located on Al Nahda Street), take a shared taxi to Jenin Central Bus Station (located on Al Jama’a Street or Cinema Street). Cost around 35 ILS. Duration: Approx. 90 minutes. Option 1 – Shared Taxi: Take a shared taxi from the Ramallah Central Bus Station (located on Al Nahda Street) to the Nablus Central Bus Station (located at Rafidiya Street). Cost around 20 ILS. Duration: Approx. 1 hour. Option 2 – Private Taxi via West Bank: A private taxi from Ramallah to Nablus will cost around 500 ILS ($140). Duration: Approx. Approx. 1.5 hour.